Ahhhh don’t you just love winter weather! One minute it is snowing, the next minute it is raining. What is more depressing on a February morning is spotting the potholes that appear overnight. 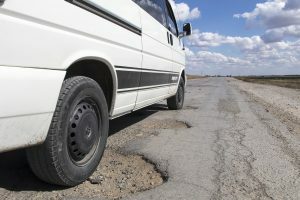 Potholes are likely to appear in winter and spring when ice and running water disrupt the soil layer beneath the road surface. Cars driving over these weak spots in the road cause the top layer to deform, crack and chip away. The holes in the road surface start off small but can potentially grow deep or large enough to cause damage to cars. If you do hit a pothole then do make sure you report it. If it is around a town then you can find the contact details on the GOV.UK website. However if it is on a main UK road or motorway then you will need to phone 0300 123 5000 or email info@highwaysengland.co.uk. MEB the Motor Centre have been repairing and servicing all makes of cars for over 40 years and are now located in Edmonton. Contact us on 020 8807 0668 to talk about how potholes may have damaged your car. This entry was posted in Uncategorized and tagged car insurance, pothole compensation, pothole damage, potholes, road damage. Bookmark the permalink. Both comments and trackbacks are currently closed.